Click on any thumbnail to see a larger version of the photo. on other web sites or for any other purpose without express permission. Update 12/5/2015 - Andy visited Walt Disney World again in October, 2015, and sent me some beautiful new photos. Check them out at these URLs: DAK-2, Epcot-3, Epcot-9, Epcot-12, Epcot-22, MGM-13, MGM-14, MK-7, MK-9, TL-2, and TL-3. Update 9/1/2015 - Disneymarks fan Andy recently sent me some excellent photos that he took in June, 2012. You can visit Poly-4, TTC-1, Epcot-6, Epcot-7, Epcot-16, MGM-2, MGM-5, and MGM-10 to see them. 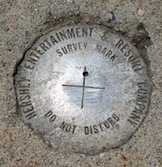 He also sent me a photo of a survey mark at Hershey Park in Pennsylvania. I'm not going to start collecting those, but you can see more about this one and log it at Waymarking.com. Update 6/7/2015 - I just got a report from Adam J. that MGM-8 is alive and well. Thanks very much to Adam for that information. Update 5/10/2015 - Nick has provided me with a number of updates around Walt Disney World. Part of the stamping on Poly-4 has been obliterated; Poly-5 and Poly-6 have been destroyed. MGM-8 may be gone; please let me know if you can check that for me. For some bizarre reason, MGM-19 has been moved a foot or so. Epcot-5 is definitely gone, and Epcot-19 may not survive the construction of the new Frozen attraction. I'd appreciate any updates on that one, too. That way you'll know right up front whether a mark is still there for you to find. 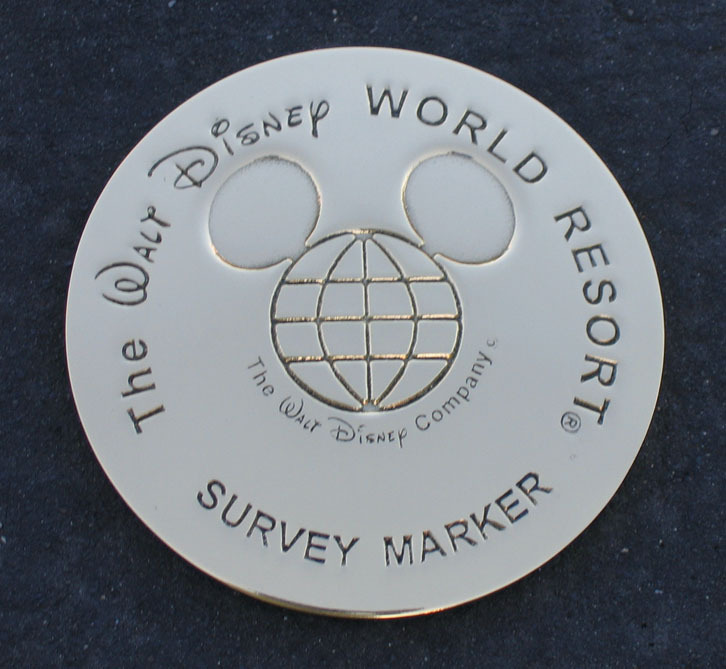 Update 4/18/2015 - Many thanks to professional cartographer Brian, who has plotted all of the WDW and DLR survey marks on maps using ESRI's ArcGIS Online website. You can view the Walt Disney World map or the Disneyland map. As Brian notes, "If you view the map on your phone or tablet, you can use your GPS to navigate around it. So in theory, you could pull the map up on your phone and use it to find the markers while visiting." Please let me know if you try that! Update 3/23/2015 - I've got updates in two locations at Walt Disney World: a new mark near a resort and a destroyed mark in one of the parks. Check out my Resorts page for the newly discovered Shades of Green mark. My Magic Kingdom page has information about the loss of MK-3 and the changes near MK-2 due to renovation of the Hub area. Update 1/12/2015 - Thanks to the combined efforts of Katherine and Nick, I've got four more marks at WDW's Wide World of Sports complex for you! Nick suspects there may be more, as part of the complex was blocked off for the big marathon weekend when he walked around the area recently. So if you get to WWoS, please keep an eye out for additional survey marks. Meanwhile, go to the WWoS section of my site to see the new ones. This section covers benchmarks at all of Walt Disney World, including the theme parks, resorts, and other areas. Benchmark maps - Brian's maps of Walt Disney World and Disneyland show the locations of all the survey marks mentioned on my website. Coordinate format - Because a lot of amateur benchmark hunters are also involved in the sport of geocaching, I've used the geocaching standard "decimal minute" format (DDD MM.MMM) for coordinates. If you prefer to use degree/minute/second format, you can perform the conversion in your GPS receiver or use the handy conversion tool at Geocaching.com. Deriving coordinates from Google Maps - Have you found a new benchmark at one of the Disney parks, but you don't know the coordinates? Simply right-click (with a two-button mouse) or CTRL-click (with a one-button mouse) on a location in Google Maps to bring up the contextual menu, then choose "What's here?" You can then click on any location and its latitude and longitude will be displayed in a small information box. You                                                                                                                                  can either send me the coordinates in Google's "decimal degree" format or use a coordinate conversion tool (such as the one on Geocaching.com) to convert Google's coordinates to "decimal minute" format. Have you heard of waymarking? It's an offshoot of geocaching in which people post the coordinates for interesting places that other people might want to visit. When you visit the place, you can take a photo of it to prove you were there, then post your photo and log that you found the waymark. It's just for fun; there are no prizes for how many sites you visit. But it gives us the opportunity to turn Disney benchmark hunting into more of a Hidden Mickey-style game. There are now waymarking categories for Disneyland/DCA Benchmarks and Walt Disney World Benchmarks. I have put links on this site from every benchmark for which there is an equivalent waymark. So it's really easy to find out where you can log the benchmarks you see at Disney properties! The finder of the benchmark will have one month after the date on which the new benchmark is published on this site to make a waymark of it. After one month, the original finder's exclusivity expires. If someone else then finds the benchmark and submits the necessary documentation, his or her waymark submission will be approved. So if you find a new benchmark and think it may take you longer than one month to create a waymark, please let me know, and I will hold off on publishing your benchmark here until you tell me that you've created the waymark for it (or are about to). See the relevant waymarking category for waymark creation rules. Note that both closeup and location photos are required to create a waymark, so keep that in mind when you're hunting for benchmarks at any of the Disney parks. Only a location photo is required to log the finding of an existing waymark. Here's some miscellaneous stuff you may enjoy. Disneymarkers - Have you been wondering what the Disney benchmarks folks look like? Okay, maybe not. :-) But if so, click here to see a photo of us. (Photo copyright 2006 Larry Klementowski.) From left to right: Larry Klementowski, Julie Klementowski, Patty Winter, Nick Enicks, Meg Lee-Lim, Lloyd Lee-Lim. 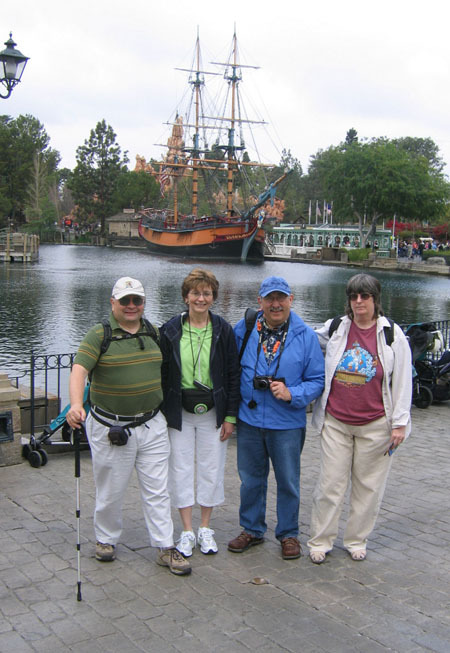 Surveying at Walt Disney World - In April, 2006, the first and current chief surveyors of Walt Disney World, Don McKinney and Bud Joiner, gave a presentation at the annual conference of the American Congress on Surveying and Mapping (ACSM). I was kindly invited to their by ACSM conference chair John Hohol. John worked for many years at Berntsen International, and came up with the idea for the Disney benchmarks. My report on the ACSM talk includes some historic photos of WDW as well as images of the different kinds of WDW and Disneyland benchmarks. An article I wrote about surveying at Walt Disney World (partly based on the above-mentioned presentation and partly on subsequent interviews) was published in the September 2007 issue of The American Surveyor. You can go straight to my article and download a PDF version that has all the photos from the printed magazine. You can also see a closeup of Nick Enicks' cover photo of Spaceship Earth. Historic WDW photo - Many thanks to John Hohol for providing me with an historic photo of early surveying at Walt Disney World. 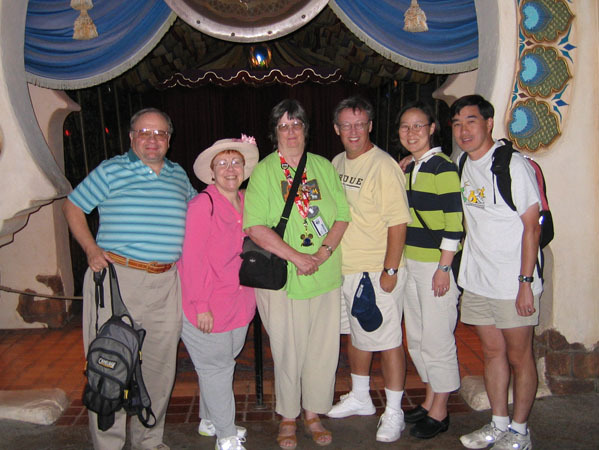 The photo was taken in the Magic Kingdom (the first of the WDW theme parks) near the hub at the end of Main Street. Notice that the buildings on one side of the street are nearly finished, while the other side still has only the internal structures built so far. Cinderella Castle is nearly done, though! The Magic Kingdom opened in October, 1971, so we speculate that this photo was taken earlier that year. The main people who provided input for this site (Larry, Lloyd, Nick, and Patty) are aware that the term "benchmark" should only really be applied to survey stations created for vertical (elevation) control. 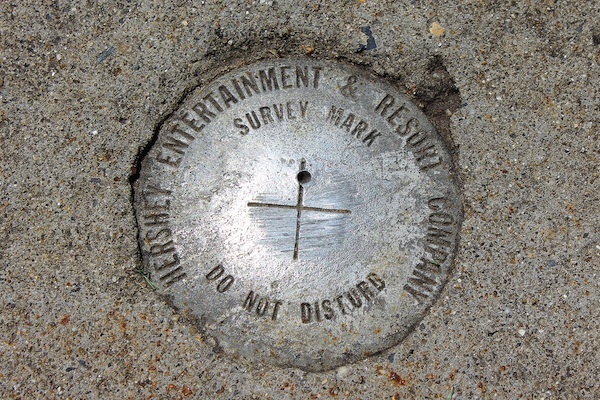 As far as I know, the marks at Disney properties are primarily for horizontal control, so technically, we should call them "survey markers," "survey monuments," "survey stations" or some such. However, this site was started by geocachers who started doing "benchmark hunting," which is what the hobby is called on the Geocaching.com website. As it happens, the four of us have gotten into it more seriously, and thanks to professional surveyors and knowledgeable amateurs on the Benchmark Hunting forum, we've educated ourselves about surveying terminology and procedures. For example, those of us who've tromped around looking for a metal disk that turns out to be 1/4 mile from its published coordinates are well aware of the difference between the terms "scaled coordinates" and "adjusted coordinates"! 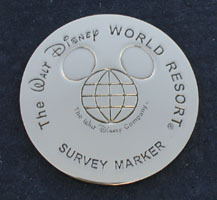 Nonetheless, this site is primarily frequented by amateurs: geocachers, waymarkers, or other visitors to the Disney resorts who aren't familiar with surveying terminology. So I've chosen to forego terms such as "survey monument" and "control station" in favor of more recognizable terms such as "benchmark" or just "mark." I hope the professionals who visit this site will understand the reason for this and not get too upset at the mangling of accurate terminology. is a trademark of Apple Computer, Inc., used with permission.